In the quest for luxurious locks, many people spend hundreds of dollars on hair products and expensive treatments every year. Between time-consuming visits to the salon and expensive trips to beauty stores, most people never consider that one of the best hair care products available sits on the shelf at their local grocery store. 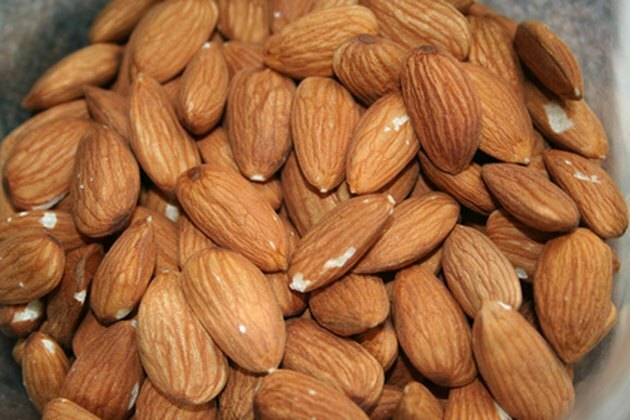 When eaten regularly, almonds protect the body against heart disease, diabetes and weight gain. Interestingly, they also pack a powerful punch in promoting healthy hair growth. Loaded with vitamins and nutrients, almonds pack a considerably nutritious punch when eaten in moderation. In fact, the Nuts For Almonds website refers to the almond as "one of the most nutritious of all nuts." A 1/4-cup serving of dry roasted almonds provides approximately 45 percent of your daily recommended allowance of manganese and vitamin E. Additionally, the nut provides nearly 25 percent of the recommended daily allowance of magnesium. According to the Hair Boutique website, magnesium is "an essential mineral for growing healthy strands." In fact, a deficiency of magnesium within the body has been linked to hair loss. When consumed properly, magnesium and other nutrients help the body to not only maintain proper functioning, but also encourage the healthy growth of hair, skin and nails. According to the Hair Boutique website, one of the most important tips a person can follow to help the hair grow is to eat a healthy diet absent of foods high in fat or sugar. Along with their wholesome nutrition, almonds indirectly help you maintain a better diet. If you are snacking on almonds, you are certainly not snacking on potato chips, French fries or chocolate cake. In fact, the Medical News Today website acknowledges that "scientists have noted for many years that people who regularly eat almonds tend to weigh less than people who do not." Since a proper diet and healthy body are essential for proper hair growth and almonds indirectly improve your diet, it can be said that almonds indirectly improve your hair's growth. Along with eating the healthy nuts, you can also apply almond oil to your hair for an inexpensive and effective moisturizing treatment. The pale yellow oil, which is extracted from almonds, features copious amounts of vitamin E and vitamin D. When a few drops of almond oil are massaged into the scalp, the oil gently smooths the hair cuticles and nourishes the scalp. If the treatment is done once every week or so, you will likely experience hair growth that is stronger, healthier and shiner. Medical News Today: Are All Calories Created Equal?